In spite of their diminutive size, these monitors turn in a seriously impressive performance. Along with claims of a linear frequency response and zero coloration, IK Multimedia tell us that their new iLoud Micro is the smallest active studio reference monitor system in the world, at just 180 x 135 x 90mm. They also claim it is the lightest, with a pair weighing only 1.7kg. 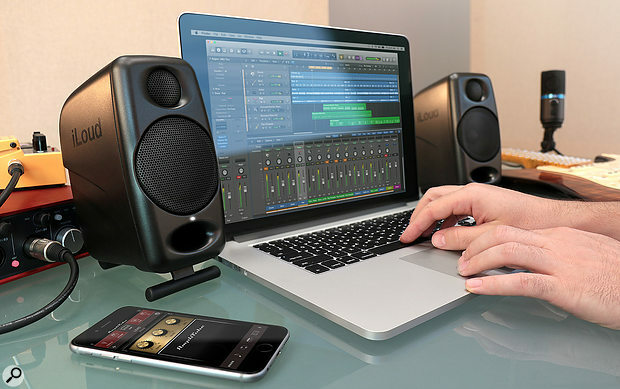 These Class-D bi-amped active monitors are rated at a total power 50W RMS and are the successors to the original iLoud, which targeted desktop studio owners or those making music on the move. This model is said to work well in small, difficult rooms. Despite their small size they have a -3dB point at 55Hz, which is impressive given that the woofer is only three inches in diameter. Their three-quarter-inch silk-dome, neodymium-magnet tweeter aims to deliver a smooth high end, while the moulded cabinet is nicely rounded to minimise diffraction and has a flared bass reflex port at the front. Internally the port is curved around in a C shape ending just behind the tweeter. Both drivers are protected by perforated steel grilles. Getting accurate sound from a small speaker is always a challenge, and this design uses 56-bit DSP to iron out wrinkles in the frequency and phase responses, as well as generating a roll-off filter below 55Hz so that the -10dB point is at 45Hz. The same DSP also handles protection and crossover duties, plus user-adjustable EQ settings. These are available to tune the HF and LF responses to the room, with positional compensation EQ for free-field or desktop placement. Three slide switches on the rear panel select Flat/Desk (+3.5dB between 1kHz and 10kHz and -1dB below 400Hz), Flat/HF (-3dB shelf at 4kHz) and Flat/LF (-3dB shelf at 250Hz). Unusually the maximum SPL of 107dB (100Hz to 10kHz) is quoted for a listening distance of 50cm rather than the standard one metre. This means the SPL at one metre will be a few decibels less. An integrated isolation base helps decouple vibrations that might otherwise find their way into the desktop, while a pull-out-and-pivot front section allows you to tilt the speaker upwards. There’s even a mic-stand thread in the base for stand mounting, though I’d feel far more comfortable with the speakers supported on something more solid than a mic stand. All the active electronics are built into the left-hand speakers, the right operating as a slave via the included four-way link cable. Note that the stated RMS amplifier power of 50 Watts or 70 Watts peak is the total shared between both speakers; the woofers are driven by 18 Watts each and the tweeters by seven Watts each. Audio can be fed in via a pair of RCA phonos or a stereo mini jack, or, as is increasingly common, audio can also be streamed in wirelessly from a Bluetooth device conforming to the A2DP protocol. A Bluetooth pairing button resides above the EQ switches, close to the master volume control. Power comes from an external PSU and front-panel LEDs show that the speakers are powered up. Having set up what look like a pair of doll’s house monitors, I didn’t really know what expect. I powered them up, put on some known tracks and was genuinely surprised by what these little speakers could do. As you might expect from their size, they lack a deep and visceral bass end, but kick drums and bass guitars still come across as punchy, with far more weight than seems possible from such a small speaker. Also important: the bass end never gets flabby. Realistically I’d say the low end stands comparison with most decent five-inch monitors as long as you listen at sensible levels. However, the solidity of the low end isn’t the biggest surprise as the clarity and imaging of the speakers right across the spectrum is more than impressive, offering an almost three-dimensional view into the mix, with every detail laid bare. Zero coloration might be one claim too far but it is certainly very low. I did find the sound more natural with the HF set to its -3dB setting but that could just be my room, as I often have to do the same when auditioning other speakers. So, they may look like toys but the new iLoud Micros are very mature-sounding speakers that allow you to look into a mix in almost forensic detail. They sound uber-clean up to and beyond sensible listening levels, as long as you are sitting within a couple of feet of them, and they make for a very pleasurable listen for general music playback too. While the performance is almost impossibly impressive given the size of these speakers, the price isn’t equally modest. The cost comes somewhere between an entry level monitor and the “it’s starting to get serious now” territory inhabited by the likes of Adam, PreSonus, Mackie, Eve and others. Nevertheless, if you need a pair of very capable monitors for checking playback when making live recordings or for taking your laptop studio on holiday, they do an unbelievably good job. They are also well suited to the smaller home studio that’s maybe based on a desk stuck in the corner of a bedroom. If a super compact monitor appeals to you, then I’d urge you to try to get to listen to a pair of iLouds — because if you don’t, you just won’t believe how good they really are. In terms of driver arrangement, the Genelec 8010A is probably the nearest equivalent. Extraordinary sound quality for their size and weight. The phrase ‘punch above their weight’ is somewhat overused but in this case it applies perfectly. Despite their pint-pot size, these are very capable monitors and so are ideal for mobile monitoring applications or for use in cramped spaces. £307.99 per pair, including VAT.